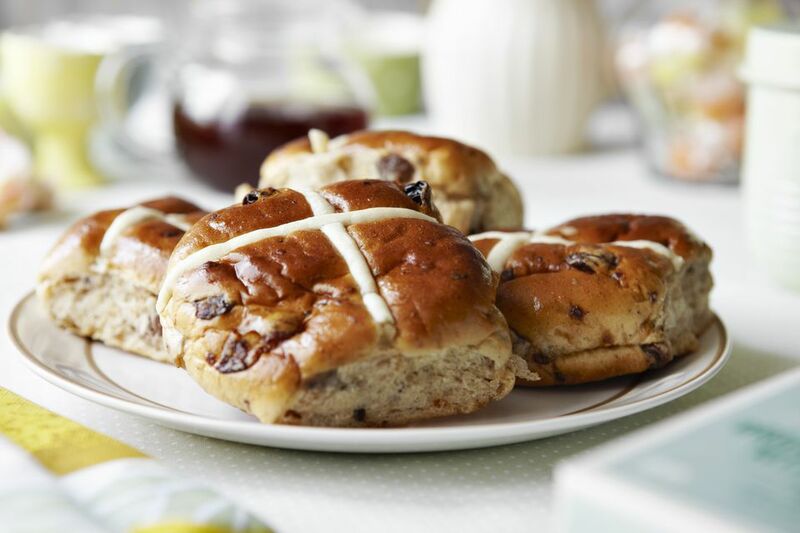 Hot cross buns are a Good Friday and Easter tradition in households throughout the world. This recipe for gluten and dairy-free hot cross buns is easy to make and is full of raisins, lemon zest and spiced flavor. You can make the dough a day ahead of time and refrigerate- making this an easy gluten-free hot cross bun recipe for busy holidays. In a medium mixing bowl, add all dry ingredients for the buns and whisk to thoroughly combine. In a 1-quart pitcher or medium mixing bowl, lightly beat eggs, add mayonnaise, coconut milk, olive oil, honey and lemon extract. Stir to combine. Add the wet ingredients to the dry ingredients and beat with an electric mixer just until the batter is combined. Fold in raisins and freshly grated lemon peel and gently combine. Use an ice cream scoop with a 1/3 cup capacity to scoop 9 buns onto prepared baking sheet. If you don't have an ice cream scoop, use a 1/3 cup measuring cup. Leave about 2-inches between buns. Dip the handle of a wooden spoon in water to prevent sticking and press handle into the top of each bun to form a cross. Place uncovered buns in a warm location and allow to rise for 1 hour. Beat one egg with 1 tablespoon water and brush buns with the egg wash.
Bake buns in preheated oven for 20 to 25 minutes or until golden and done. While buns are cooling, mix the gluten-free powdered sugar, coconut milk, grated lemon zest and lemon extract. Stir with a fork until lumps are gone and icing is smooth. Use a spatula to scrape the icing into a plastic sandwich bag. This makes piping the icing on the buns easier but you can drizzle the icing on with a small spoon if like. Pipe icing on buns to make crosses. For convenience, you can make the bun dough the day before you plan to bake and serve the buns. Put the dough in a container with a tight-fitting lid and refrigerate. Remove the dough from the refrigerator about 3 hours before baking. Allow the dough to come to room temperature.